Product Specs | Skate On This! 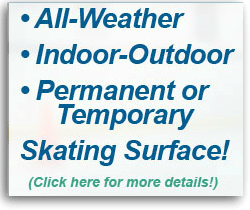 “skate on this” synthetic skating rinks are made to simulate real ice as closely as possible, while delivering the best, most economic system available to your skating patrons. High durability, low maintenance, flexible configurations, and a host of options and accessories make “skate on this” the favored choice of hockey players and ice skaters around the world. All components are thoroughly tested and carefully engineered to make installation and removal as easy as possible, and versatile enough to provide a unique skating experience for many years, no matter what the season.